Spongebob: Hi, Squidward, wanna play? Spongebob: Hi, Squidward, want to play hide-and-seek? Squidward: Okay, Spongebob, you hide first. (closes the curtain) Oh, no, where'd he go? I guess he wins. (laughs) Defeat has never tasted so sweet. (phone rings) Yello? Spongebob: How 'bout a game of Hangman? Spongebob: How about Duck, Duck, Hermit Krab? Hopscotch? Squidward Says? Steal The Bacon? Sleeping Sea Lions? Sharks & Minnows? Sink The Submarine? Kings & Queens? Mohjongg? (Squidward is beginning to fume so he picks up Spongebob and shakes him) Whoa, I've never played this game before. What's it called? Mini Squid: Hello, Squidward. (Squidward screams and hides behind a bush) Squidward! It's me, Mini Squid! Squidward: What are you doing, Spongebob? Squidward: What manner of annoying scheme is this? Spongebob: Just say hello to him, Squidward. You know how sensitive he is. Squidward: Hi. Now, Spongebob, what the...? 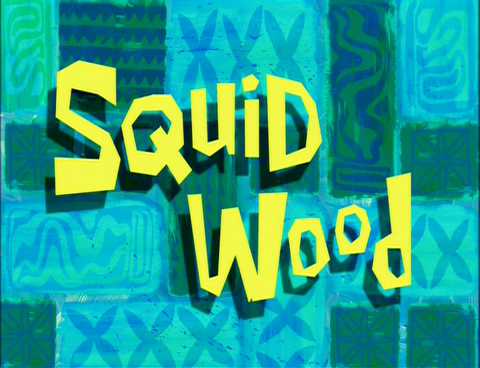 Spongebob: Uhh, Squidward, he prefers to be addressed by his full name. Mini Squid: Wonderous weather we're having, eh, Squidward, old pal? Squidward: Spongebob, what is the meaning of this? Mini Squid: Spongebob made a replacement you: me. So when you you don't want to play, Spongebob will play with me-you. Squidward: So, you'll be filling in for me when Spongebob wants to play one of his stupid games? Mini Squid: Three words. Movie title. (gasps) "12 Angry Jellyfish". Spongebob: How does he do it? Right again, Squiddy. You little charades master, you. Patrick: (to Mini Squid) Squidward, you look a little different. Wow. Have you been working out? Spongebob: Good one, Mini Squid! You are always such a ray of sunshine. Are you ready for another fabulous day of work at the Krusty Krab? Mini Squid: Of course, I am. I love to work! Male Fish #1: Who is that little fellow with Spongebob? Female Fish: I don't know, but isn't he handsome? Squidward: Oh, sorry, sir. Can I take your order? Mini Squid: Sorry, sir. Can I take your order? Male Fish #1: Now that's more like it. Finally, a server with a good attitude. Mini Squid: Well, thank you very much. Male Fish #1: I'll take eight dozen of your finest patties, please. But don't let old chowder pants over there touch them. He might taint the patties. Squidward: I'm starting to like this Mini Squid doing my work, keeping Spongebob off my back. I could get used to this. Spongebob: Order up, Mini Squid! Squidward: What the...? That's my joke! Male Fish #1: Wow, honey, this new Mini Squid is such a card! Female Fish: And a great waiter, dear. Squidward: Oh boy! Back to work! Mr Krabs: Hold on a second, there. Mr Krabs: Uh... Squidward, me cephalopod, I'm sorry to tell you this -- well not that sorry -- the customers prefer the new smaller Squidward to you. And so do I! 'Cause he's making me some bucks. So I'm changing your job to busboy, effective immediately. (hands Squidward dirty dishes) Now pipe down and watch how it's done. Mini Squid: Hey, everybody! I'm Squidward and I love to dance. Fred: (gasps) Talk about no talent. Talent Agent: Stop, stop! Don't gnaw on the head of my new client, please? You don't know what you're doing. Are you mad? Have mercy! Squidward: Wait a minute. I've seen you before. You're that music agent that represents my favorite clarinet player. Talent Agent: Salutations! I'm Milo J. Finkerfish: manager for "Curly Bubbles Records". Squidward: You mean you're here to sign me up for a record deal? Talent Agent: The answer to that question is a big N-O. (points to Mini Squid) However, this guy here is woo-hoo woo-hoo good! We're offering him a million dollar contract with a sequin suit. Spongebob: Well, Mini Squid, I guess this is it. We've had some good times playing charades and dancing around like two giddy butterflies! (laughs) Remember? Mini Squid: Yep, those were the days. Spongebob: I guess it's time for you to move on, huh? Onto greener pastures. Arrivederci, mon frere. Spongebob: Bye-bye! What's the matter, actual-size Squidward? Squidward: My dreams are crushed. But, hey, at least I won't see that Mini Squid ever again!